The Hi Friends! books aren't great. The language introduced isn't always useful, the methods to introduce the language aren't always effective, and calling some of the activities inside "fun" is an insult to the word. Unfortunately, if you teach at Elementary Schools as an ALT in Japan, you are going to have to use those books whether you like it or not. But fear not. 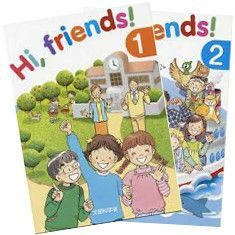 As long as you go into your classroom with the correct mindset, you can have some great English classes using Hi Friends! You don't have to use everything! Some of the activities included in the Hi Friends! books are actually kind of awesome. Use them. If it's your first year as an ALT, it might take some trial and error, but it won't take you more than one or two times through an activity to know if it's a winner. For those that you like, use those games liberally. On the other side of the coin, there are plenty of activities in Hi Friends! that aren't great. Some of the games don't seem to have a point, other games have little-to-no interaction, and there are some really boring listening activities. Skip these. Unless the teacher with whom you're working is adamant about going through the book verbatim, pick and choose the activities you want to do, rather than going through everything top to bottom. Now, this of course means that you'll have to come up with some other methods to teach/practice the grammar point, but this gives you a chance to inject some of yourself into your classes, and that's always a good thing. Think of it as an opportunity to be an awesome teacher, which is why you came to Japan, right? Don't think just because the teacher's manual writes out detailed rules to any particular game that you have to actually follow them. For example, Hi Friends! 1 has an activity where people introduce themselves from all over the world in video form. The book instructs you play the video and have the students repeat it. I've tried this activity. As impossible as it might be to believe, it's even more boring than it sounds. So, I changed it. I made this activity a guessing game. After having the students close their books and eyes, I would play a video of one of the countries and have the students open their eyes and watch. Instead of having the students repeat, "My name is ___" 10 times, I would ask "Where is he/she?" and wait for a response. Now, at this point in their studies, they most likely haven't yet learned "Where is he/she?" But you can use hand gestures to explain it, and then guess what? Your students are learning things. A boring listen-and-repeat activity can be turned into a fun guessing game with zero additional effort required from the teacher. Throughout the book, you'll find many opportunities for tweaks like this. Even if an activity looks like a dud at first, brainstorm about whether a small change might make the game more fun (and thus, actually usable). For all of you new ALTs, all this straying from the teacher's plan might sound intimidating. But if you want your lessons to be as effective and fun as they possible can be, it's essential. Most teachers will be on board with your tweaks, and guess what? When you can successfully make an adjustment to an activity, your JTE will immediately respect you more as an instructor. But this isn't just for new ALTs. Constantly looking for ways to improve lessons helps to keep your teaching experience fresh. After three years of teaching the Momotarou lesson, I was exhausted. But when I allowed the students to make their own characters, it became fun again. Even if you've already got a great game for a particular lesson, there are always little tweaks that can be done. Put in the extra work to find these little tweaks, and your classes (and the amount of fun you and your students have in them) will be much better for it. James is the founder of ALTInsider.com, a website aimed at helping you have more fun while teaching in Japan. It features complete Hi Friends lesson plans, classroom and teacher's room advice, a podcast, and a resume review service. Have more fun! For more from James, head over to ALTInsider.com. Read his great tips for having a legendary lunchtime or check out one of his many podcasts, like what it's like to work at a hotel in Japan.